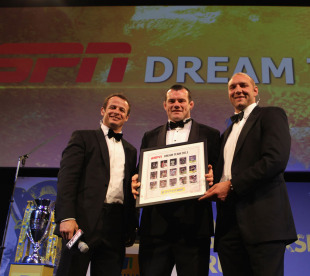 At the Aviva Premiership awards on Tuesday, ESPN's Austin Healey and Ben Kay announced their Dream Team following a rollercoaster season. Here we give you the rundown of who the Leicester legends deemed worthy of inclusion. Rock-solid as always, Brown commanded respect at the back for Quins and also chipped in with 21 clean breaks across the course of the season - placing him second on the standings in that department. Despite Sarries' rotation policy, the electric Strettle played 19 Premiership games this season, scoring five tries. More than his try-scoring however, he gave Saracens an out at every opportunity - making 22 clean breaks and beating 43 defenders. Named as Discovery of the Season at the Premiership awards, Tuilagi's debut season was something to behold. He terrorised defences and laid on some crushing hits in defence, even if his enthusiasm got the better of him at times. Firmly in the frame for an England call. After a couple of seasons in the wilderness following his England debut, Allen really hit his straps during this campaign. Where Tuilagi was eye-catching, Allen was solid and dependable, in the best sense. A strong passing game and good understanding with Toby Flood made him very effective throughout. Ashton added a further 10 tries to his impressive Premiership tally this season - giving him a current haul of 27 from 40 career games - and also made his breakthrough at Test level. His support running and poaching instincts earned rave reviews in November and the Six Nations, but were also on display week-in, week-out for the Saints. The 27-year-old Kiwi bagged the golden boot for the second consecutive season and if you want the one reason why Newcastle stayed up, you can look no further. His 230 points for the campaign gave him 100 more than the rest of the squad combined. The England scrum-half is of vital importance to Quins and the pace at which he plays underpins their new open style, pioneered this season by Conor O'Shea. Along with Nick Evans and Nick Easter he forms the backbone of the side. The giant Saints prop was somehow overlooked for the Player of the Year shortlist, but it's impossible to doubt his impact on Northampton's season and style of play. Explosive out of the blocks, a great scrummager and committed defender, he's got it all. One of the league's most exciting players, and one of the most consistent, Brits continues to do what few other hookers in the world game can. Has improved his set-piece work so that it now stands alongside his brilliant pace, handling and support play. Bagged the Premiership award for Try of the Season. The rock at the heart of the Saints' brutal scrummage, the former Springbok tight-head has been dominant all season in the tight and is more than happy to go toe-to-toe with Tonga'uiha in a battle to impress with ball in hand. No other side in the league can boast a lock like the athletic Lawes. He tackles like a back-rower, is tireless around the field and in tandem with Christian Day has helped the Saints sculpt a very strong lineout. The Irish lock, brother of Test centurion John, led the Chiefs with distinction all season, also forming a formidable second-row partnership with James Hanks. Hayes played all 22 games of Exeter's season and his efforts are not likely to be forgotten any time soon by the club's supporters. Officially the Player of the Season, Wood seamlessly slotted into a competitive back-row at the Saints after his switch from Worcester and did enough to ensure five starts for England during the Six Nations. Quick, athletic and with strong skills at the breakdown, expect him to be around for some time. As hard as nails, Burger has characterized Saracens' grit and determination since arriving last season. If they are to go on to the title this season their Namibian flanker will be at the heart of their effort in defence and attack. Arguably the signing of the season, the former Crusaders No.8 lit up the Premiership, playing 21 of Leicester's games. He topped the table for most carries across the campaign and was fifth on the list of metres gained - behind four fullbacks. Also declared his England eligibility.